Matthew's Daddy is preparing to drive him to kindergarten when the car has trouble starting. Although his Daddy is eventually able to get the car working, Matthew is worried he'll have trouble picking him up from school by the end of the day. "Then I will come and fetch you in the neighbour's big red tractor," Daddy says. And if the tractor is being used? Then Daddy will wake up Matthew's teddy bear for a ride. With the rhythm of a lullaby akin to an updated (but still timeless) version of Hush Little Baby, Daddy Long Legs rolls along with increasingly outlandish scenarios that Matthew's Daddy makes up to promise him that he'll always be there for him. Rendered in bright, citrusy hues – vibrant lime greens, lemon yellows and grapefruit pinks – the illustrations are eclectic enough to balance out the sweetness of the story. On the Far North island of Icy Land, a warbler named Warble is a devoted human watcher. Although the other birds on the island pay little mind to the visiting tourists, Warble is always on the lookout for new Behatted Bibliophilic Females or Bald-Headed Glitzy Males to spot. Then one day, a thick fog rolls in, putting a halt to Warble's human-watching. Warble seems to be the only one concerned about the rapid environmental changes; the other birds appear to not even notice a difference. Warble starts to feel apathetic himself, until a chance encounter with a like-minded human inspires him to look outside his immediate community for help. The plot is a bit stilted and the metaphors vague – for all the buildup, the fog seems to go away on its own – but Warble is a sweet and compelling enough character on his own. Pak's watercolour and pencil illustrations are playfully reminiscent of Nova Scotian painter Alex Colville. Spring arrives in the forest and the trees bloom in lush shades of green. 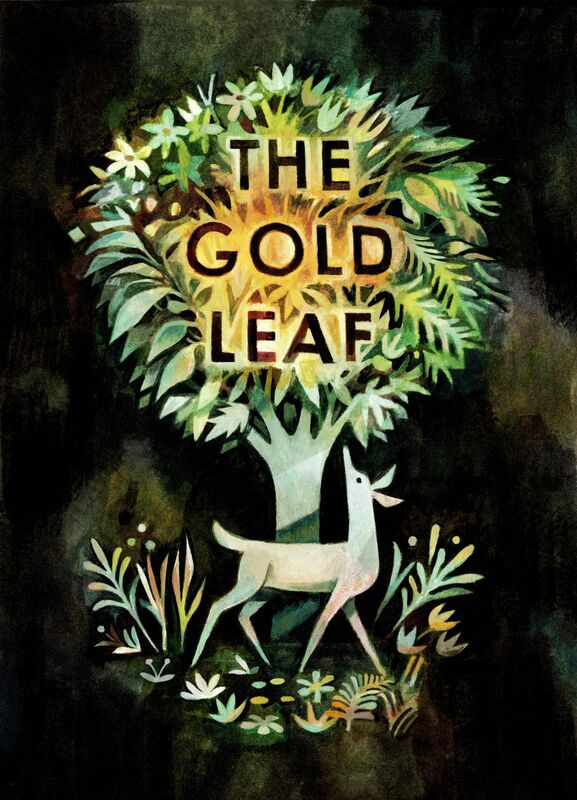 The attentions of the animals become focused on one particular leaf that glistens in gold quite literally on the page. Shimmery foil is an effective gimmick that made a generation of kids fall in love with Marcus Pfister's The Rainbow Fish, despite the overwhelming schmaltz of that book. Here, the effect is used much more sparingly, with elegant results. As explained in the author's note, gold leafing is "an art form invented by the Egyptians three millennia ago," in which gold is pounded into sheets "as thin as butterfly wings." The creatures of the forest fight over the mysterious gold leaf and, again as in Rainbow Fish, there is a lesson to be had about the dangers of greed. But whereas that book ended with the other fish forcing Rainbow Fish to mutilate himself so that everyone could have one of his glittery scales (seriously, go back and reread it, it's a messed up book), in The Gold Leaf the animals learn that they don't need to possess the leaf in order to enjoy it. Nature, after all, is not about consumption, but appreciation.